Saintpaulia ionantha, or African violets, are small flowering houseplants that flower continuously. They are available in colors such as violet, pink and white, among others. 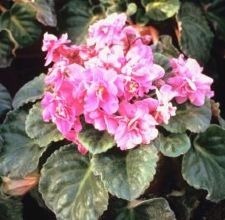 African violets are susceptible to several different fungal infections, including powdery mildew. Several different pathogens cause powdery mildew on African violets, including Oidium, Leveillula, Microsphaera and Ersiphe, among others. The disease is more problematic when humidity levels rise over 60 percent and there is little or no air movement. Powdery mildew forms a network of grayish-white fungal growth on the plant’s surface that penetrates the top layer of cells. The fungal matter gives infected plants a generally untidy and unattractive appearance. Infected blossoms have a shorter life span. Severe cases of powdery mildew dry out the plant tissues and cause plant death. Plant disease-resistant hybrids. According to Joyce Stork from the African Violet Society of America, several of the ‘Melodie’ and ‘Ballet’ hybrids are more resistant to powdery mildew infection than other strains. Place a small fan in the room to create air circulation, and keep the humidity level below 60 percent. Use an appropriate fungicide as soon as the first symptoms of disease appear.